Ticks: they can be downright scary whether you find one on yourself, your child’s body or even on your pet. 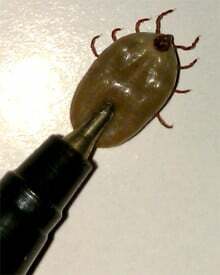 Often, people remove a tick incorrectly as a result of which, parts of its head remain embedded in the host’s skin. Naturally when this occurs, people wish to know what will happen if they do not remove the tick completely. Ticks, as most of us already know, are quite capable of transmitting serious infections, including Lyme’s disease, especially when they have remained embedded in the skin for a period of 2-3 days. However-you mustn’t worry. Simply follow these guidelines described below for complete and correct tick removal in order to ensure that you, your family and pets are safe from such infections. What to do if you see a tick on your baby or a pet? Check if there are bite marks or rashes or embedded ticks on the victim’s body. In case of pets with thick fur, use a flea comb to brush it out. If you see ticks, catch and immerse them in alcohol or vinegar solution. Alternatively, you can flush the tick in the toilet. If the tick is still embedded in the skin, follow the steps given below to safely remove the entire tick. How to remove a tick safely? Always use tweezers to remove a tick-never your bare hands. This will lower a risk of infection. In case there are no tweezers available on hand (if you are outdoors), use a tissue paper to grab hold of the tick. Always grab the tick closer to its mouthparts- this is the part that is embedded in the skin. Gently and vertically pull the tick out. Avoid grabbing the tick’s swollen belly as this can push back infected fluid inside the host’s skin. Do not rush or forcefully pull the tick out as this could break it, in leaving behind body-parts. If you are unable to remove the tick, do see a medical expert immediately. You can discard the removed tick in alcohol or freeze it in a Ziploc bag to get the experts to identify it later. Immediately wash the skin with antibacterial soap and/or apply an antibiotic cream or lotion such as Neosporin or Bactricin. If a rash appears, visit the doctor immediately. Do not use Vaseline or petroleum jelly to remove the tick as this could smother the tick. People are also known to use nail polish, matchsticks, gasoline as well as rubbing alcohol for tick removal. All these methods are not effective and can even be dangerous. Do not even try to burn the tick when it is still attached to the skin. What to do if you are unable to remove the tick completely? Many times the tick’s mouth-parts or head remains embedded in the host’s skin. This does not always increase one’s risk of infections, but one must treat it in the same way, as one would a splinter. Do not dig around in the skin to remove the remainder of the tick, as this can increase the risk of skin infections. It is best to let nature take its course as the human body (or even that of your pet) will expel the tick out naturally by itself. Watch out for signs of fever, muscular aches and pains, loss of concentration, and general malaise or fatigue after you have removed the tick. If these signs occur, visit the doctor immediately. Should you be concerned about Lyme disease if you are unable to remove a tick completely? Ticks do carry a lot of microbes depending on its type as well as the region you are living in. That is the main reason why you should remove the tick immediately using the methods of safe tick removal explained above. Even an infected tick which is removed within the first 24 hours can greatly reduce chances of infection from Lyme disease microbes.That being said; you must keep an eye out for signs of joint pains, muscular spasms, fever or chills etc following this episode. Today, tick borne diseases are easily cured using antibiotics provided one seeks early treatment. Also, ticks are found in most states in the United States but majority of the cases of Lyme disease and other tick borne infections are concentrated in parts of New Jersey, New York, New Hampshire, Connecticut and Pennsylvania. People living in the wooded areas of the North East coast of USA are at a greater risk of tick borne illnesses. Why are doctors hesitant in prescribing antibiotics immediately? Is there a vaccine against ticks? This is a question asked by people who believe they haven’t removed a tick completely. The thing is; antibiotics are not fully capable of fighting Lyme’s disease. Also, the dangers of antibiotic overuse are quite well known- most germs tend to get resistant to these drugs which can then pose several other problems. Hence, more and more experts recommend the wait-and-watch approach. There was a vaccine used to protect people and pets living in the risky zones. However; it is not approved for use on kids and has been pulled out of the market. What are the safest ways to protect oneself from tick bites? Keep your kids and pets away from wooded areas. When camping or hiking on grassy trails, wear full pants and full sleeved shirts. Apply insect repellents like DEET sprays all over the body. Check yourself and your family for ticks after coming back home from hikes. Wash all clothing in hot water. Use vet approved products on pets for tick repellence. These preventive measures and safe tick removal methods can protect you and your family from many tick borne diseases.